Freshpet may be some of the only cat food you’ll buy from a fridge, but is it any fresher, safer, or more nutritious than the average cat food brand? Find out in our unbiased Freshpet cat food review. We’ve analyzed Freshpet and graded it according to the We’re All About Cats standard, evaluating the brand on species-appropriateness, ingredient quality, product variety, price, customer experience, and recall history. Here’s how it rates in each of these six key areas. We give Freshpet cat food a 33 out of 60 rating or a C grade. All Freshpet foods are steam-cooked in Freshpet’s company-owned Pennsylvania facility. About 97% of the ingredients in Freshpet foods are sourced from the United States and Canada. While all food ingredients are sourced in North America, the company sources vitamins and minerals from other regions. Though China is the biggest supplier of synthetic vitamins and amino acids, Freshpet maintains that they don’t source any ingredients from that country. Has Freshpet cat food been recalled? Freshpet cat food has never been recalled. What kinds of cat food does Freshpet offer? Freshpet offers three lines of cat food. They include Freshpet® Select, the brand’s original line, Vital® foods with 80% meat, poultry, or fish content, and Nature’s Fresh®, which uses chicken and turkey from farms that follow the Step 1 and Step 2 animal welfare standards established by the Global Animal Partnership. Chicken and ocean whitefish appear to be the primary protein sources in this cat food. This Freshpet food is made with chicken, ocean whitefish, eggs, and a smattering of veggies. It’s one of their kibble-style foods and comes in bite-sized soft chunks. The first three ingredients are chicken, chicken liver, and ocean whitefish. Chicken is a species-appropriate source of nutrients, as is nutrient-dense liver. Ocean whitefish is less than ideal due to its potential for heavy metal and toxin contamination. Note, also, that ocean whitefish isn’t a single species of fish. The term may refer to haddock, cod, and a host of other fish with similarly white flesh and mild flavor. Eggs are added as an additional source of animal protein. The food is supplemented with carrots and spinach, ingredients with little nutritional benefit for cats. The food contains pea protein, a concentrated source of plant protein. It’s also made with pea fiber, a pea derivative that boosts the food’s fiber content. The food contains vinegar, possibly as a type of preservative, and is supplemented with potassium chloride—sometimes marketed as lite salt. This salt alternative is lower in sodium but has some of the same preservative effects as standard salt. In addition to potassium chloride as a type of preservative, the food contains celery powder. This ingredient is a natural source of nitrates. So much for “no preservatives”. Overall, this food is high in protein with moderate fat and low carbohydrate content. The food has 231 calories per cup. Chicken, Chicken Liver, Ocean Whitefish, Natural Flavors, Eggs, Carrots, Spinach, Pea Protein, Pea Fiber, Vinegar, Vitamins & Minerals (Zinc Chelate, Calcium Sulfate, Potassium Chloride, Iron Proteinate, Niacin, Vitamin E Supplement, Copper Proteinate, Thiamine Mononitrate, Manganese Proteinate, Vitamin A Supplement, Riboflavin, Calcium Pantothenate, Pyridoxine Hydrochloride, Biotin, Vitamin B12 Supplement, Vitamin D3 Supplement, Folic Acid, Calcium Iodate, Sodium Selenite), Salt, Taurine. Chicken and beef appear to be the primary protein sources in this cat food. Like all foods in the Vital line, this slice-and-serve roll is 80% meat. In the case of this recipe, that meat is chicken and beef. The food has a paté texture, but instead of coming in a can, it’s squeezed into a tight roll that you slice and serve. The first ingredient is chicken, cooked in chicken broth and mixed with beef and chicken liver. The food is flavored with “natural flavors”, which Freshpet describes as “a proprietary blend of natural ingredients used to enhance the flavor of our fresh foods.” The term typically refers to a flavor additive made from hydrolyzed animal tissues, but Freshpet’s proprietary blend may incorporate other ingredients. In addition to the main protein sources, the food contains fresh eggs as a highly bioavailable protein source. Tapioca starch and carrageenan are both added to help bind and stabilize the food. While food-grade carrageenan is generally considered safe, it could be contaminated with degraded carrageenan. The latter is a known inflammatory agent with potential carcinogenic effects. In addition to its primary animal protein ingredients, it contains pea protein, a plant-derived protein concentrate sometimes used as a cost-effective alternative to animal protein sources. Another pea derivative, pea fiber, is included as a source of soluble and insoluble fiber. Though Freshpet promises that the product doesn’t contain any nitrates, it does contain celery powder, a natural source of sodium nitrate. Instead of potassium chloride, the food is made with salt. The food is high in protein with moderate fat and low carbohydrates. The food has 272 calories per 8 ounces or 34 calories per ounce. Chicken appears to be the primary protein source in this cat food. This product from Freshpet’s Select line is almost identical to the the last slice-and-serve roll we reviewed. 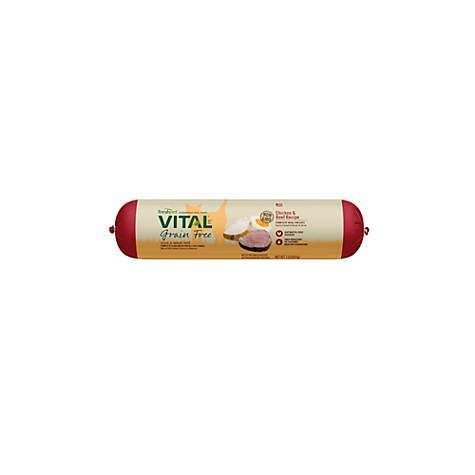 Like the Vital Chicken & Beef roll, this roll from the Select line focuses on chicken, chicken broth, beef, and chicken liver as primary protein sources. It contains eggs and pea protein as secondary proteins. 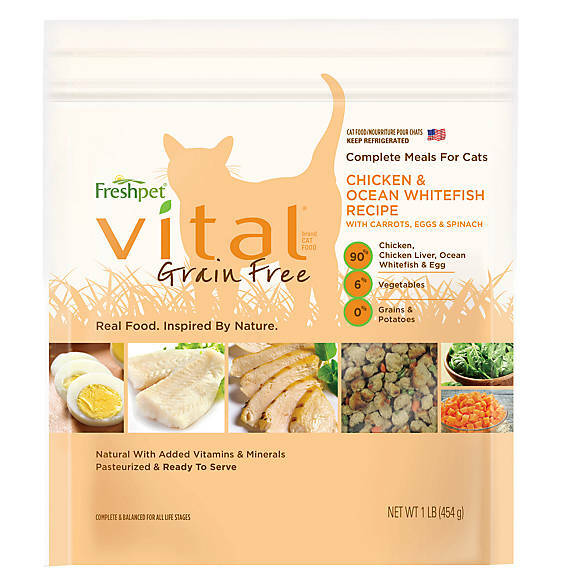 Like the Freshpet Vital roll, the food is thickened with both tapioca starch and carrageenan. These ingredients increase the food’s carbohydrate content and, due to carrageenan’s potentially inflammatory and carcinogenic properties, significantly reduce its appeal. Unlike the recipe reviewed earlier, this food contains fish oil as a natural source of omega-3 fatty acids. Fish oil is rich in DHA and EPA, the types of beneficial fatty acids that carnivores require. Overall, this food is rich in protein with moderate fat and low carbohydrate content. It offers a species-appropriate, meat-heavy nutrient distribution. The food has about 34 calories per ounce or 272 calories per 8 ounces. Freshpet receives primarily positive reviews on its product listings, but things trend towards negativity once you look beyond Freshpet’s website and their retail partners. While over 50% of Consumer Affairs reviewers are satisfied with the brand, unhappy customers share similar complaints. Freshpet is supposed to stay fresh for a week in the fridge, but many reviewers say they opened up the bag to find smelly or moldy Freshpet cat food. And as it turns out, Consumer Affairs is just the tip of the rotten Freshpet iceberg. Similar reports appear on social media and discussion boards. After about half an hour of web browsing, I counted 88 customer reports of not-at-all-fresh Freshpet. Complaints include bloated bags, sour smells, moldy food, and pets getting sick after eating questionably-fresh food. Dozens more customers didn’t say the product was spoiled but that their pets fell ill after eating Freshpet. “I started buying the chicken bites about a year ago when I lived in California. My cat LOVED it and I saw a great change in her behavior. Before she was always hungry and crying for more food no matter what I gave her. When I tried the chicken bites, she calmed down, slept through the night and wasn’t begging for food. In fact, she only ate a small amount to be satisfied. I always provide dry food and, of course, water. When we moved to Oregon a few months later, I started buying the chicken bites again, but they would not last. As soon as I opened the package it would start to deteriorate quickly. The expiration date was months away. I thought it was a fluke, so I tossed it and bought another one. Within a day, it had mold growing and the stench was so bad that I had to seal it up and take it outside. I decided to take it back to the market. The odor was so bad that the manager gave me a refund and two free bags as an apology. How much does Freshpet cat food cost? Freshpet’s cost varies by line and product type. If you choose one of Freshpet’s rolls from the Vital™ line, you might spend over $4 every day to feed a 10-lb cat. If you opt for one of the brand’s kibble-style foods in a bag, your daily feedings costs will go down to $0.98 to $1.16—comparable to some of the cheapest wet foods or homemade raw. Overall, is Freshpet a good choice? Frankly, you could do a lot better than Freshpet cat food. On the bright side, Freshpet cat food is typically lower in carbohydrates and plant ingredients than the average dry food and many canned products. Most of their recipes, particularly those in the Vital™ line, are rich in the animal ingredients cats crave. The food’s biggest selling point is the idea that it’s a preservative-free food that’s minimally processed and belongs in the refrigerator instead of the pantry. This marketing angle is misleading on multiple levels. Ironically, Freshpet food is loaded with salt, vinegar, and celery powder and can last longer in the fridge than the average canned food. Hill’s recommends that you throw out opened cans of cat food after 5-7 days in the fridge. You can leave an open container of Freshpet in the fridge for 14 days—or so says the company. All of this salt means Freshpet food is extremely high in sodium—sometimes containing as much as 10x the daily recommendation for cats—which deters some customers. It’s interesting to note that it doesn’t appear that sodium has any negative health effects for cats. In fact, a high sodium diet makes cats drink more water and could reduce the incidence of urinary tract disease. And besides being packed with more preservatives than the average canned food, Freshpet cat food doesn’t always make it to the expiration date. Indeed, Freshpet is very often not fresh at all. There have been so many reports of Freshpet spoiling before the expiration date or making pets sick that the potential benefits of this purportedly fresh food seem hardly worth the risk or the cost. 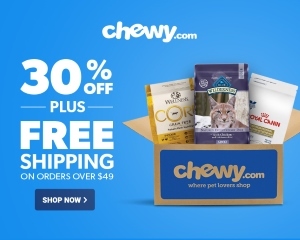 You’ll find Freshpet in groceries, big box stores, pet specialty retailers, and natural food stores in the United States, Canada, and the United Kingdom. Freshpet Select is sold primarily in groceries and Vital™ is available through pet specialty retailers. Nature’s Fresh is sold in natural food stores. Freshpet cat food isn’t currently available online, but you can use online retail sites to browse the product selection and check for the products’ availability in local stores. Some online services including Instacart and Peapod allow you to have Freshpet cat food delivered to you from a local store. Click here to shop for Freshpet cat food at Petco.